Distinguishing Characteristics African-American female. Black hair, brown eyes. Sheketah wears eyeglasses. Some agencies may spell her name "Sheketa." 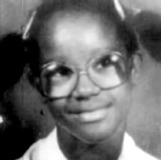 Sheketah resided with her mother, Carolyn; her father, James Michael Brown; and her younger brothers, Barry and Brandon, in 1985. Carolyn and James had been married for ten years and were employed as teachers. The family resided in Port St. Lucie, Florida. James resurfaced in Savannah, Georgia several weeks after his family's disappearances. He checked into the hospital under the name Demetrius Jones and stated someone had robbed him and shot him in the head. His true identity was discovered and he admitted he had murdered his wife and children and tried to take his own life.